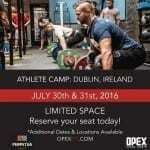 Athlete camps are designed to teach you where you sit in the spectrum of fitness. We have designed the weekend to be difficult and organized so that it is doable for all levels of athletes that seek to see their innate genetic potential. It is a fantastic way to understand where you sit today, and give you a set of tests that you can go back to later to understand how you either have or haven’t progressed with your training. We create an open environment for athletes to give all they have on those two days with no judgment attached, just the TRUTH. There are 2-4 testers per day; some testers will not be as hard as the others. Your results are compiled over the 2 days and we use the data to give you an idea of where you currently sit. We will test strength and skills, muscle endurance and all energy systems. Whether you crush every test or struggle mightily there is no judgment, no right or wrong, just data on where you are at TODAY! We aim provide an environment that promotes learning and direction based on your goals and the results you put out during the weekend. Open discussion to any questions please come ready to be engaged in open conversation.